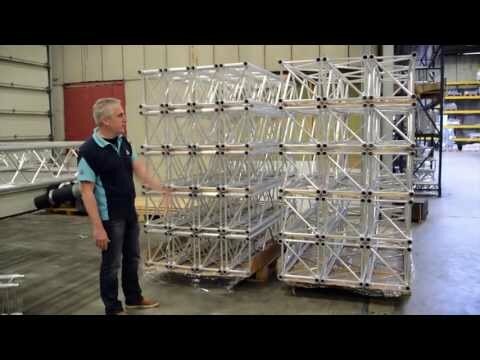 The H40R truss is a rectangular standard H40 truss constructed of main tubes (48,3 x 3 mm) and diago­nals (20 x 2 mm). Equipped with the CCS6 conical coupling system the H40R has a clever program of specifications; compact and strong the H40R has three-sided webbing, the thicker braces on the bottom side allow easy mounting of moving heads and central loading, reducing the torsion effect resulting from one-sided loading in standard trusses. The spigot orientation follows that of the S series truss, allowing easy assembly while the truss is still on the floor. The H40R measures 387 mm high by 287 mm wide. The H40R is available in all standard lengths as well as a box-corner, a box corner attachment and the H40R MPT adapter; completing the H40R range to a convenient and flexible range.